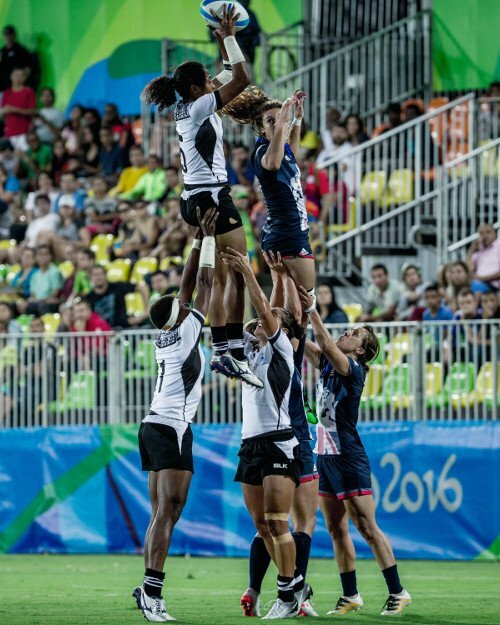 The Fijian Women’s National Rugby Team Fijiana made history in 2016 when they became the first women’s rugby team from the Pacific region to qualify for the Rio Olympics. They were only one of 12 national teams in the world to qualify to complete in the women’s rugby sevens competition at Rio despite facing countless adversities to get there. Fijiana’s journey is representative of women’s rugby not only in Fiji but in other Pacific Island nations, where Pacific women are defying the odds to claim a space in this male-dominated sport. Until very recently, women rugby players regularly faced discouragement, disapproval and ridicule just for playing the sport. Some even experienced severe punishments – beaten or chased out of their family homes. The early development of the sport was almost entirely attributed to the determination and sacrifice of the players, coaches and supporters who organised and financed the game. In addition to the lack of financial and technical support, the players faced many challenges at community and family levels. Today, the Fiji Rugby Union is fully supportive of women’s rugby. FRU has a dedicated and passionate Women’s Rugby Development Officer and finances and organises national team selections, training camps, tours and other activities. While current players are receiving far more support than the former generation did, even today, resources do not match those available to men’s rugby, and female players continue to face a multitude of challenges on a daily basis. The players struggle to secure consistent playing schedules, fields, referees, medical support and other facilities andservices, and even to meet the most basic needs for jerseys, shoes, appropriate diet or bus fares to reach training grounds. Many run or walk several kilometres to training grounds every day. In short, while the whole nation exalts male rugby players as heroes of the people, their female counterparts have had to jump countless hurdles, and endure condemnation, harassment, punishment and sometimes even ostracism, only to play their beloved “national” sport. Yet, they have remained resolutely committed to the game, and the obstacles have never dampened their passion. They have held their heads up in front of crowds and continued to return to the rugby field, even if no one is there to cheer for them, even if bystanders shout abuse, telling them to ‘go back to the kitchen’. It is against all odds that Fijiana have made a series of remarkable accomplishments in the last few years. In 2011, the Fijiana 7s won the gold medal in women’s rugby sevens at the Pacific Games. In 2012, they qualified for the 2013 IRB Rugby World Cup Sevens by winning all of their matches at the Asian Women’s Sevens Championship. In 2013, they won the Bowl at the IRB Rugby World Cup Sevens in Russia. In 2014, they qualified for the 2014–15 World Rugby Women’s Sevens Series by again winning all of their matches at the qualifier tournament in Hong Kong. In 2015, they won another gold medal at the Pacific Games and qualified for the Rio Olympics by winning the Oceania Women’s Sevens Championship. The magnitude of their participation in the 2016 Rio Olympics must be understood in the context of Fiji’s sporting history, where, prior to the introduction of rugby sevens as an Olympic Game, a total of only 21 athletes had ever participated in the Olympics by actually qualifying, not as wild cards. Fijiana has shown that women have the ability to achieve any dream, even against the toughest adversities. They have shown that it is fine, and actually wonderful, for women to be physically strong, tough and powerful. They have shown that rugby, Fiji’s “national” sport, indeed belongs to everyone. – Dr Yoko Kanemasu, Senior Lecturer in Sociology, The University of the South Pacific.